The festival season is always followed by a hangover of mithai. Ladoos, barfis and more crammed into precious refrigerator space. Too yummy to throw and too rich in calories to eat. Here is a delicious way to upcycle festive mithai at your next social dinner. 3. Add cardamom powder and sugar and cook again till has reduced to almost 1/4th of the original quantity. This is the rabdi. 5. Create layers by alternating crushed laddoo and rabdi. Additional ideas: If you have leftover gulab jamuns, chop them into small pieces and add them to your cake batter. You can also layer up barfis, rasgullas, and gulab jamuns to make a parfait. 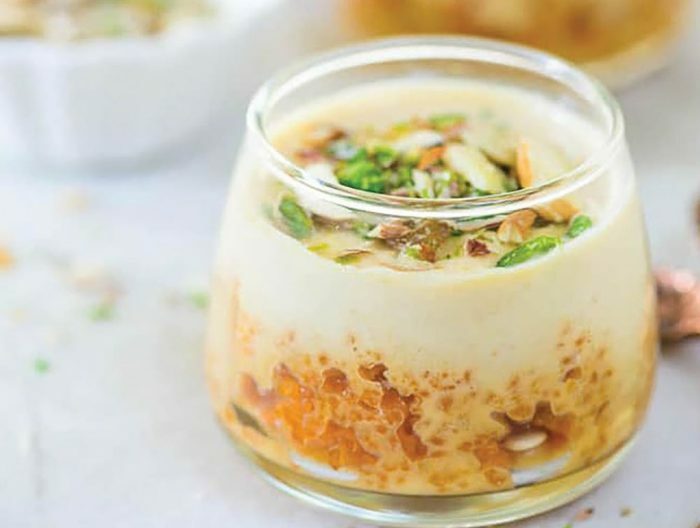 Place mithai at the bottom of a glass and layer it with custard, and later ice cream. You can do the same with barfis and pedas. Mash them and add hung curd or whipped cream and chopped fresh fruits.